During my web development years, I got these questions a lot: How to convert an HTML table to DIVs and SPANs? How to put several DIVs on the same line? How to make give a SPAN width and height? Etcetera DIV, etcetera SPAN. So to make it easier to explain and refer to again later, allow me to present this ‘demo’ slash step-by-step tutorial. Hope this helps! We are having a big project in my company. A pretty big one, which requires a couple of new servers running Windows 2008 R2 64-bit and SQL Server 2008 R2, with IIS (Internet Information Services) running and hosting local websites. And this project will save us time and money when it’s live. Unfortunately the project is confidential so I can’t disclose it’s nature But at least I can share with you readers and fellow IT professionals about my experience with downloading—and redownloading for soooo many times—stuff from MSDN, and also the discovery of a free program that allowed me to resume/retry interrupted downloads. Read on if you are also having problem with your downloads and are looking for a solution. Google Mobile sites can’t remember your login? But anyway, it works fine now, and I’m a happy person again (hyperbolically speaking :D). Read more to see how I solved it. One adage that I keep telling myself is as stated in the title above: Practice makes perfect. Want to be good at computer programming? Practice! Want to be good in writing articles? Practice! Want to be good at web development? Taking picture? Problem solving? Practice, practice, practice! And with my son studying first-grade math now, the same maxim holds true to him as well—”Practice makes perfect, son,” I keep telling him. Don’t get me wrong; he is good a math. In fact, he is a GATE student, an avid reader with a keen interest for scientific facts, and a future ocean animal scientist slash doctor slash inventor, whatever his final decision be. But still, silly math mistakes happen, and one way to prevent it is to practice more. I had him done more additions and subtractions, and I DO see the result of the drill. So what tool did I use? 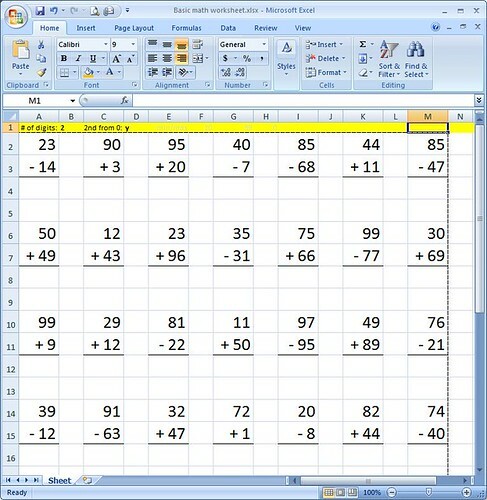 Just a simple Excel sheet printout! With formulas, of course—this is a perfect ‘practice’ opportunity for me too, don’t you think? Beware: Too many invalid cPanel logins can cause you unable to see your site! “Sure! What’s the problem?” I replied. Good, so everything on that site was down… except that it’s NOT! I was on that website in that very second—using Firefox, in case the problem with my client was due to his IE misbehaving. What a mystery… Anybody care to guess why?